Set in Suwon, about 30 kilometres south of Seoul, Hong Sangsoo’s Golden Leopard-winning masterpiece is divided into two sections which are almost exactly the same. Even the opening credits are repeated once the film reboots an hour in, though with one subtle yet noticeable difference placed there for attentive viewers to make of it what they may: the title, at first Right Then, Wrong Now, has been reversed to read Right Now, Wrong Then. Both parts of the film have two main characters, a few secondary ones, and take place in the same public spaces: a temple, a bar, a restaurant, a university auditorium, an alley, and a street. The subject is the usual one for Hong: desire, as articulated in the everyday verbal and non-verbal exchanges between men and women from a specific social class. The verdict is also the same: communications between males and females are often well-meaning but ultimately defective (if not total failures), and thus they contain the potential for both humour and heartbreak. The plot of Right Now, Wrong Then is formed by a minimal situation upon which a delay and a set of variations of brief scenes are established. Hong’s narrative method lies in delaying the initial premise that would normally be immediately developed by other filmmakers in order to reach a satisfactory resolution. Rather, Hong’s minor-key story is structured in a way that never fully closes what it started; when the main characters have left the screen, the film may be finished, but the ending remains open to all possible universes. In Right Now, Wrong Then this entails the premature arrival in Suwon of, yes, a filmmaker, Ham Chumsu (Jeong Jaeyoung), to present his latest film at a festival and deliver a talk. Because he’s arrived a day early by mistake and has free time, Chumsu decides to visit a temple where he meets Yoon Heejun (Kim Minhee)—a beautiful, wistful young woman who aspires to become a painter—in the room of the temple devoted to receiving blessings. After a chat in the temple they leave together to have a coffee and then go visit her atelier; later on, they dine and drink together, then pay a visit to some of her friends. Finally, Chumsu walks Heejun home, where she still lives with her mother. Next day, he presents his film, and has a particularly rancorous exchange with the moderator of his Q and A. That’s all. The narrative power of Hong’s film is based on delaying and stretching time, with the idea being to postpone actions in order to intensify some of the characters’ behavioural traits in relation to modifications generated by the characters’ conversations. What we find in all of Hong’s work is an order in this repetition, a grammatical pattern. An hour into Right Now, Wrong Then, this gets—literally—duplicated, as if the film contains a remake of itself within itself. While the film’s situations are repeated following the exact same order, as is usual in Hong differences are produced within this repetition, caused by reasons that are not fully understood and based to a large degree on chance. Changes happen through minimal variations, both in terms of the emotional construction of the characters and, in some instances, modifications in the development of situations. The premise of this game of repetitions and duplications is the uncertain nature of any relationship or situation. For example, in the first part, when the characters visit Heejun’s atelier, she acts insecure, and in reaction Chumsu overpraises her painting, which is seen onscreen in great detail (thus generating the later awkward situation where his words are thrown back at him). In the second version, for whatever reason, Heejun is more sure of herself, and Chumsu’s comments on the painting are much more critical, while the painting itself remains off-screen. This minimal difference in Heejun’s attitude leads the same situation with the same characters towards a different result, illustrating how reliant Hong’s structure and dramatic action is on contingency. The main gags in Hong’s seemingly effortless comedies are linguistic, verbal entanglements based on a slight disconnection between what a character says and does, and the way this disconnection is perceived. As in a number of Hong’s other films, the mechanism behind Right Now, Wrong Then can be encapsulated in the utterance of a single word, which here is “sensitivity.” Uttered at a specific point in a conversation, this word becomes the cause of a misunderstanding because it is also a sign that denotes something else, something unsaid. Such words are always associated with the power evoked through one character’s description of the other, a presumably keen observation through which unknown personality traits are revealed, and become a cause of unconscious pleasure. In a brilliant passage set in a café near the end of the first part of Right Now, Wrong Then, Heejun’s friends realize that Chumsu’s advice to Heejun about her art—that she doesn’t know where she’s headed, and because of this she’s bound to discover more in the process, even if this will be a difficult path requiring courage to reach the end—are precisely the same words Chumsu uses to describe his own filmmaking in interviews. Projection here is a discernible mechanism: what he sees in her is what he values about himself. It should be mentioned that Jeong Jaeyeong, who won the Best Actor prize at Locarno, is extraordinary. The naturalism of his actors is a trademark of Hong’s cinema, but Jeong’s nuanced performance—most notably during an extended passage in a sushi restaurant where he drunkenly professes love and proposes marriage, his indescribable face juxtaposing shame and happiness distorted by soju consumption—is especially remarkable given that Hong’s actors have to perform knowing that, as their director often employs long takes, there likely won’t be any close-ups where they can use facial gestures to help them convey a feeling or a deep emotion. The only opportunity for the actors to unveil unsaid feelings at a closer proximity to the camera comes in Hong’s characteristic reframings within a single shot, the forward and backward zooms which usually coincide with some alteration in the emotional frequency of the verbal interaction (sometimes with changes in the setting). There are 32 zooms in Right Now, Wrong Then, which almost without exception occur when there are changes in the nature of a conversation’s logic or in the emotional consequences provoked by dialogue. In the first version, during the café scene, Heejun finds out the famous director whom she is falling in love with is married with children. When the situation becomes clear, the camera slowly zooms forward on Heejun and relocates her right in the middle of the frame, where her emotional modification is made intensely evident. Detractors might claim Hong Sangsoo is merely doing the same thing over and over again, but it’s clear that he has become a specialist in employing repetition as a filmic and anthropological structure. Paradoxically, the lightness of his films achieves an extreme degree of depth. Repetition is one of the most delicate and difficult devices to deal with in general, because something that appears to be always the same sooner or later ends up drifting away into something unexpected, an unstable transformation that can only be captured and controlled by a patient filmmaker. In creating a remake of his film within the same film, Hong reaches the truth of his subject matter not through words themselves, but by filming failures in human communication between stereotypical characters—here, an arrogant filmmaker and a struggling young artist—particularly in relation to the indirect speech game played during the development of sexual attraction. The secret lies in using stereotypes in order to then move away from them, and through that operation offer a glimpse at a behavioural matrix. Over the course of its two-hour running time, Right Now, Wrong Then renounces any trace of neatness or stylistic affectations, which is not to say that beauty is cast away. The final shot of Heejun walking away from the cinema on a snow-covered street is, without a doubt, an honest expression of all that is pleasant in the world. The same can be said about an unassuming opening insert showing a statue of Buddha on a roof adjacent to the house of Heejun and her mother. Beautiful shots such as these are speckled throughout the film without being over-stressed—they are there for those who look carefully—and taken as a whole these represent a truly astonishing visual regime that traps in its spell those viewers who are open to it. It wouldn’t be such a bad thing to stay and live inside of Right Now, Wrong Then. This is a kind and beautiful film. And those are in short supply. Cinema Scope: We know that Right Now, Wrong Then is the title of your movie from the festival program, but in the opening credits, before we know this film will have two parts, we see it’s called Right Then, Wrong Now. One might think that you’d changed the title at the last minute before the world premiere. This leads us to something which is not new in your films but was never so clear as in this one: the notion of déjà vu, something that is not conscious in real life but that cinema can reproduce as a construction. 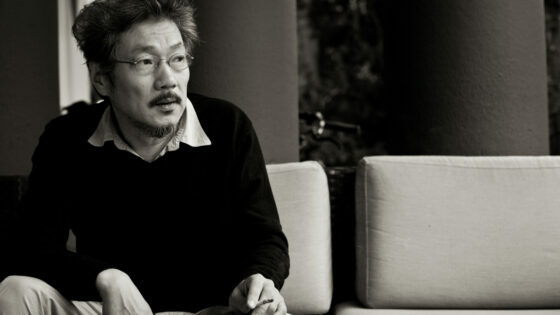 Hong Sangsoo: We could say that, yes. I didn’t think about déjà vu as the basis of my formal structure and yet… Well, in the second part, the character of the director doesn’t know the girl he meets. We cannot say that she reminds him of someone or something from his past. But the audience knows him and knows her when the second part begins. But I did give Jeong Jaeyeong the instruction to act as if he had an immediate, strange connection with her, a strong sympathy—to feel like you know her, but you can’t explain why. In this sense, talking about déjà vu makes sense. Scope: As you explained in the press conference, you shot the first part, edited it, and then showed it to the actors, so the actors were aware of how the situation was structured, even if their characters in the second part are not. Perhaps because of this, in the second part one could say that there is some kind of moral improvement, even an elevation, in the way they relate to each other. But maybe déjà vu is actually what makes certain that everything doesn’t go perfectly the second time around, because it’s a troubling feeling. 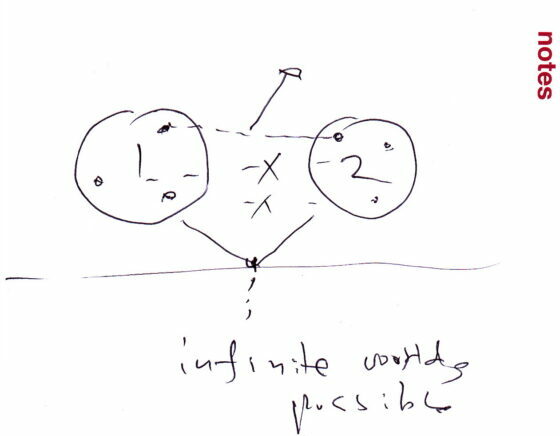 Just look at these two circles in the drawing as two independent worlds. If you believe there’s a clear reason for these two worlds to exist, once you find a clear meaning between them, then these worlds themselves disappear. Once we make clear sense out of these two worlds, they are just used up. It happens that it’s not easy to give them a clear meaning. So all the questions are kept alive if there’s an infinite possibility of worlds. It’s like a permanent reverberation. Scope: Even though the two parts are parallel worlds, still, continuity is important in the film, the fact that the second part comes after the first one. If you were doing videos for an art gallery you could show both parts on two screens at the same time, and things would happen in a parallel way. Hong: Even if you put it together like that, you have to see something first, then something next. You can’t avoid the time frame. What’s important is what you think over the course of the experience of going through that time frame. Scope: I don’t believe you’ve ever shot a film in Suwon. Hong: No, this was my first time. Scope: Is there something special about that city? What was your feeling when you shot there? Hong: Nowadays I start my films with almost nothing, I mean, basically with two things: places and actors. I didn’t know anything about Suwon. Maybe I read a couple of things a long time ago that gave me a feeling about the place. It’s kind of a bleak city. I went there one day, met some people, walked in the neighbourhoods, and decided to work there. For example, the sushi bar in the movie is a place I just found by chance. The owner is a very nice guy, I told him, “I’m Hong Sangsoo, I’m a filmmaker, and I’ll be shooting in three weeks with my small film crew. My way of working is kind of strange, so I don’t know the exact date. Can you allow me to do that? Maybe I will come back twice or three times, but I will inform you as soon as I know.” He said, “OK, but not on the weekends.” So I made some deals with these places, but I didn’t know what I would do there, I just chose them intuitively. Scope: Are first impressions important to you when you meet an actor that you’re planning to work with? Hong: It might be a prejudice of mine, but I believe that when I meet an actor, first impressions are the starting point for everything. The person interests me above all, that’s the core: I see them as persons, and have no opinion about their work as actors. I often don’t even know what films they have done before. Based on this impression, sometimes I remember something that happened to me a long time ago, some situation, some dilemma or lost memory. Scope: How did it happen this time with Kim Minhee, whom you’d never worked with before? Hong: As simple as this: I asked her if she was available to work with me during this period. So then I had two main characters and some locations. At that point I have maybe two months before shooting, and some thoughts may emerge, but I never finalize them. I make some important decisions three or four days before the first day of shooting, like if I’m going to shoot a scene in front of the palace, and the characters will meet each other there. So I call the places, and tell them we will shoot something there. Very early on the first day of shooting I start writing the script for that day, in the office or even at the location. I start at 5:00 or 6:00am, and it can take three hours, sometimes five hours to write. Scope: For how long have you been working this way, without a full script? Hong: For my first three or four films I did it like everybody else. Then I started to avoid the script, and I had like 20 pages summarizing the whole thing. But even this, as I used to call it, “treatment,” became more and more compressed over the years. This compression became something more radical when I shot Oki’s Movie (2010). I just had a few notes. The “treatment” was gone. Scope: You write better under pressure? Hong: I kind of enjoy it, yes. Scope: I’m interested to know how your films “flirt” with reality and with your own life and experiences. Let me give you two examples: I didn’t know Kim Minhee and when I googled her name, the first thing I read was that she was a model before she became an actress—which is something her character Heejun refers to. Then at the end of the second part, she is at the cinema watching Chumsu’s last film and, as you mentioned in the press conference, what we hear is the sound of your previous film Hill of Freedom (2014). Your films may not be based on real characters or your life, but there’s always a transmission. Imagine this rectangle is real life. I try to come as close as possible to it. How? Using details of my life, things I’ve lived, things I heard from other people I know or I just met. I always mix different sources, and it’s never about myself, but it looks like something that happened, or looks like its about me. I want it to be like that. I realized that when I was 23 and was writing a script based on a real story. I felt too tense; I couldn’t move. I needed distance. In the same way, my films are never a parallel line to reality. 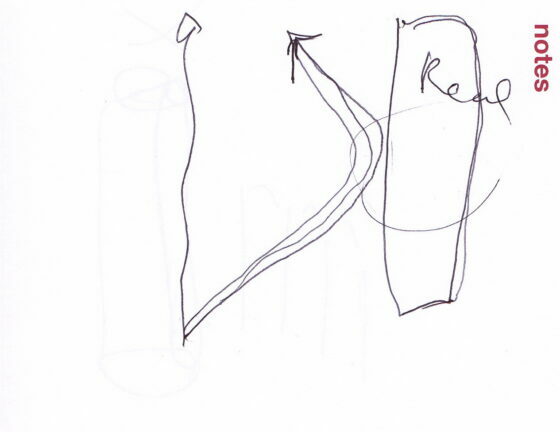 What I tend to do is to follow an arrow towards reality, avoiding it at the very last second. Scope: You said before you don’t care what your actors have made before working with you. But still, you almost always use professional actors. It means you value and trust their skills and ability to act. Hong: I worked with total amateurs before, in The Power of Kangwon Province (1998). I realized that at the same time they are genuine, showing us their true colours, but their thickness is too slim. It’s weak. It happens that my line, which seems natural, is actually artificial. It has to be very precise, and amateurs cannot adapt to it. That’s why I work with professionals: they can be very precise and do what I want them to do. But I don’t see them as actors when I first meet them. Scope: Have you ever fired an actor? Hong: Once I almost did. I wanted to get rid of an actor. He had many stupid ideas. So I called him, he came to my apartment, and then we went to the playground at night and talked…and he agreed he would do things differently. Scope: You said yesterday that you always think of the same types of characters and situations because you are the same person. But you’ve been making films for 20 years now. And you’re not the same person. As you show in your films, when things repeat, everything that remains is transformed. Hong: Yes. For instance, I felt differently 20 years ago about my mother than I do now. But I can use the same elements and show at the same time what changes I’ve experienced. Sometimes totally new elements come to me, but I don’t look for them in each film, I don’t feel I need them—what I do with the same elements is important. The kind of dilemmas and problems I’m interested in life only change gradually. My main character is a film director but he could be someone else, with another profession. But since I know quite well what a filmmaker is, things just became easier for me this way. Scope: You are constantly looking for new faces, new actors, but you stay faithful to the same technical team, especially your cinematographer Park Hongyeol. Is it crucial for you to keep a kind of family together? Hong: Well, filmmaking is one of the most important things in my life. When I make films I want to be happy and surrounded by good people. They don’t have to be really skillful, nor famous, it’s just important to me that they aren’t assholes. Scope: Do you always decide where to put the camera? Scope: And only one camera? Hong: Only one. Always. I decide the angle, as the angle says many things, as does the camera movement. Hong: Two different shots with two different points of view. When I meet a DP for the first time, I always tell him that he has to accept that I’m going to decide the angle. That’s the first question. Scope: Do you have time to rehearse with your actors? Hong: When actors read my script in the morning they start to memorize the first scene. I give them maybe 30 minutes with the script, then I meet them, and they read the lines— it’s a precious moment that I really enjoy. Then I correct a little bit, not much, it takes maybe 30 more minutes, and then we start shooting. We then go on to the second scene of the day, and while we are moving locations and setting up the next scene, we repeat the process. Scope: And you do very few takes? Hong: Usually less then ten, sometimes 15. In very rare cases I can go up to 30 takes. But usually it’s seven or eight. Scope: Why are there always scenes of people drinking in your films? Hong: Because I like to drink; it’s an important aspect of my life. Why should I avoid this kind of situation I’m so familiar with? I have no hobbies. Many people fish or travel, etc. I don’t. Scope: Would you ever consider making a film with an actor who doesn’t drink? Hong: I did it! I respect the taste of each of them. Some of them just couldn’t drink—their faces became red—so then I gave them fake soju. For me it’s just more comfortable to be seated and drinking soju then…coffee. Scope: You are often compared to the same directors, for example, Eric Rohmer. But are there other artists who influenced you who are not so obvious? Hong: I don’t know who I should mention, but they are almost all writers, novelists. Hemingway is important, Chekhov and Dostoyevsky too. But the artist I admire the most is Cezanne. When I discovered his paintings at graduate school I thought they were perfect—I don’t need anything else. I felt an intimacy that really touched me. I had the feeling of being in front of perfection. Hong: I cannot explain to you why I use zooms, I really can’t. I started using them on my sixth film. I just felt one day that I would like to get closer to the actors without cutting the shot. By doing it I discovered that I could create a special rhythm in continuity. And it’s so easy. I just kept doing it ever since. I didn’t want to make it my trademark. Scope: It was an accident? Hong: But all the important things that happened to me in my life were by accident! Becoming a filmmaker was certainly one of them. The people I met, the women I fell in love with…I was 20 years old and doing nothing, not even preparing for my university exams, and I met this playwright. He was drunk. I sat beside him and he asked me, “Sangsoo, what are you doing in life?” “Nothing,” I said. “Well, you might be good as a theatre director.” Then I thought about this, and entered university to study theatre. It happens that their department was quite bad. I didn’t like their doctrines. So I looked outside the window and there was the film department on the other block, and there were two or three guys going on the street to shoot with a camera. So I transferred to the film department. Scope: Did you meet your wife by accident too? Hong: Yes! She was passing by when I was coming out of a library at the university. I liked her face and she was very friendly. I worked up the courage to ask for her phone number. I picked her up in the morning and we went to the seaside near her house and I asked her if she wanted to be my girlfriend. Two or three months later I asked her to marry me. Scope: Will you ever act in one of your films or are you too shy? Hong: I’m shy, but not too shy. But I know I’d be a terrible actor so I guess that will never happen. Or at least it’s beyond my horizon.